On Tuesday evening, the New Statesman hosted a panel-based event in a lecture hall adjacent to Parliament Square entitled “When might England become Smokefree?”. The subject matter was a report from Frontier Economics which calculated when the UK would achieve the government’s stated ‘smoke-free’ target of 5% smoking prevalence or less, under various scenarios. Politicians behind Early Day Motion 999 have congratulated the Scandinavian countries that have benefitted from smokers switching to snus, and are urging the government to end the snus ban. News of this comes as the New Nicotine Alliance (NNA) is set to hear how their European Court of Justice case is going. The NNA took a case to the European Court of Justice on the 25th January as part of a push to overturn the ban on snus across European Union countries. It was argued that the current ban is “discriminatory, irrational and disproportionate”. Late last year, Stanton Glantz, a professor at University of California San Francisco and probably the world’s most prominent anti-vaping crusader, was sued for alleged sexual harassment, discrimination and other misconduct directed at a young woman he was supposed to be mentoring. As previously reported, the sexual misconduct allegations made the headlines but other aspects of the allegation pose a bigger threat to him and his multimillion dollar anti-tobacco enterprise. Last week I called for retraction of a flawed study by University of California San Francisco’s Benjamin W. Chaffee, Shannon Lea Watkins and Stanton A. Glantz that appeared in the journal Pediatrics (here and here). Once again using the FDA Population Assessment of Tobacco and Health (PATH) survey, the same authors exaggerated the gateway effect of e-cigarettes, hookah and smokeless tobacco in a January JAMA Pediatricsarticle (here). I criticized at that time the omission of information that would have provided context for their findings (here). The exaggerations were amplified in the media. Panic Over JUUL And Teen Vaping..
We are pleased to announce that CASAA’s Board of Directors recently elected Bruce Nye as President of the Board and Jennifer Berger-Coleman as Vice President of the Board. We are also excited to announce that Jim McDonald has joined our Board of Directors. An analysis by University of Michigan researchers Kenneth Warner and David Mendez from the School of Public Health found that in the most likely of several simulations they ran, nearly 3.3 million life-years could be saved by the year 2070. Smokers have been slapped with another setback after the NSW government announced e-cigarette smokers will face fines of up to $550 if caught smoking in public spaces or public transport. NSW Parliament passed legislation, the Smoke-free Environment Amendment Bill 2018, that bans vaping from the same spaces in which cigarettes are banned, despite compelling evidence on e-cigarettes and heat-not-burn products published by Public Health England (PHE) that found e-cigarettes are saving thousands of lives each year. In the George Orwell classic Animal Farm, there was a binary notion that the animals lived by – “four legs good, two legs bad”. Association of Vapers India (AVI), a national organisation that represents e-cigarette users, has welcomed Rajasthan government’s plan to conduct a study to assess health effects of vaping before taking any decision about the future of the non-tobacco product. Rajasthan health minister KalicharanSaraf announced the state’s decision on Thursday. If it (e-cigarette) is found harmful in the study, directions will be issued to ban it in the state, Saraf said. The debate surrounding harm reduction is hotting up in Australia. A latest study supports the idea that doctors should think about using ecigs to help struggling patients who can’t quit smoking. Many Australian tobacco harm reduction advocates believe the opposition to vaping is running out of steam. Rangers Football Club has hit a snag with its new vape shop sponsor. Some are saying that vaping has become a teen epidemic, and a store in Manchester has a unique solution to troublesome kids. 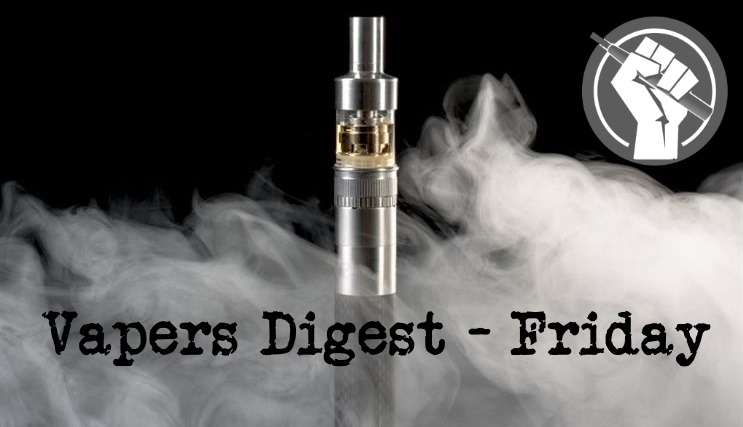 Dear Advocate, I think that if there is a single issue that all vaping advocates would agree on it would be that we are far too reactive and not nearly proactive enough in our approach to the challenges we face. I cannot think of a single issue we have had to deal with in the past where we were not responding to some action or statement by Tobacco Control, some industry or regulatory body. We always seem to be, ‘coming in’ after the event. The hypocrisy of some beggars belief. Our Hiqa [another bunch of tax funded clipboard carriers] commissioned a study into electrofags. Despite there being evidence to the contrary, what business is it of theirs anyway?